Sold and Fulfilled by seller. The watch case’s special polymer coating provides reliable protection from damage. This is the material used for coating pistol handgrips. To demonstrate, you can tap the watch against a wooden object such as a shelf; the case will not be damaged! - A reliable Japanese movement with a special super lithium battery which will work for over 40 months! - Special silicone straps made of silicone or rubberized plastic – reliable and comfortable! 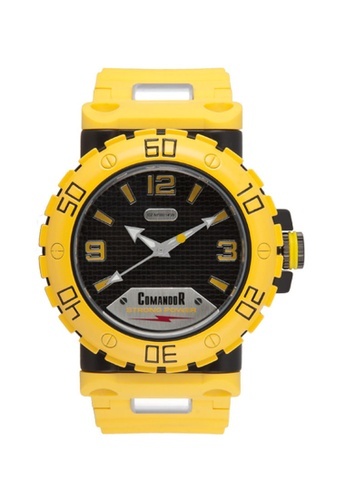 Can't find Comandor Water Resistant Sport Watch in your size?